This chapter includes the analysis of the degradation of calcium carbonate (CC) composites employing the CC composites degradation model described in Sect. 3.2.3. In addition, it presents a second analysis of the experimental data presented in Chap. 6 using an extended method which takes advantage of the detailed nature of the data. 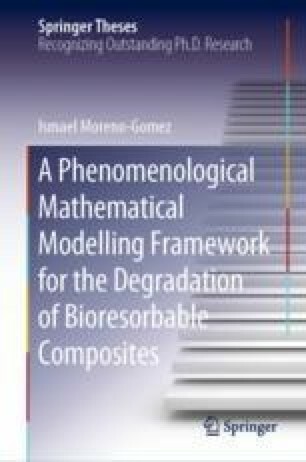 Chapter 7 is the third and last chapter dealing with the use of the ceramic-specific degradation models, derived from the general modelling framework, to analyse the degradation of biocomposites and thus, presents a structure similar to Chaps. 4 and 5. The first section, Sect. 7.1, presents the calcium carbonate composite degradation data harvested from literature. Section 7.2 reports the different types of calcium carbonate encountered in the harvested data and the values of the ceramic-dependent constant for each one of them. Similarly to Chap. 5, the values of the polymer-dependent constants are not included. Those values can be found in Sect. 4.3. The values at the time origin of the variables employed in the CC composites degradation model are included in Sect. 7.3. The results of the degradation simulations are presented in Sect. 7.4, followed by the discussion in Sect. 7.5. Section 7.6 contains the conclusions derived from the different analyses of the degradation of calcium carbonate composites. The detailed analysis of Chap. 6 data is presented in Sect. 7.7. And lastly, in addition to the calcium carbonate specific conclusions, Sect. 7.8 contains a summary of the core insights derived from the composite degradation analyses carried out in Chaps 4, 5 and 7 with the three ceramic-specific computational models. PubChem (2005a). CID: 10112. Retrieved September 1, 2016, from https://pubchem.ncbi.nlm.nih.gov/compound/calcium_carbonate#section=Top. Mindat Online Database (2016b). Calcite. Retrieved September 1, 2016, from http://www.mindat.org/min-859.html. Mindat Online Database (2016a). Aragonite. Retrieved September 1, 2016, from http://www.mindat.org/min-307.html. Mindat Online Database (2016c). Vaterite. Retrieved September 1, 2016, from http://www.mindat.org/min-4161.html.